An Atlanta television station has scrutinized GEICO’s encouragement of customers to use ABRA — which led to allegedly unsafe repair work on two vehicles. In what anchor Justin Farmer calls “the ugly truth between a shiny paint job,” WSB-TV on Thursday posted coverage of what appears to have been pretty egregious repairs from the national MSO. Chris Allen, general manager of Osborne Bodyworks, told the network that ABRA allegedly spliced replacement parts into still-damaged portions of a Kia Sorento’s frame, used a weight to make a dented front wheel (since moved to the rear) appear to yield a balanced vehicle, and left a wiring harness damaged or with splices which failed. A 2010 Honda Fit repaired by a different ABRA location allegedly failed to do more than a dozen welds on a 2010 Honda Fit, WSB-TV reported, citing Allen, whose LinkedIn profile states is ASE certified in damage analysis. Other welds can be propped with a pry bar, according to the station. Both Davison and Sorento owner Candice Prescott told WSB-TV GEICO encouraged them to use ABRA. The Thursday report is also notable for obtaining an interview with a former ABRA technician who said the chain favors insurers by letting speed trump quality. That’s interesting support for a theory often posited by independent repairers about MSOs in general. GEICO re-examined the vehicles and called them total losses, according to WSB-TV. It ultimately did not respond to station requests for comment. The report is particularly troubling because care are only going to get more complicated to repair, which mean shops will need to bring their A game. The 2015 model of Davison’s Honda Fit, for example, uses more high-strength-steel to cut 57 pounds, according to a 2014 Honda Body Repair News meant for auto body shops. That means repairers might have new locations which can’t receive sectioning or heat. 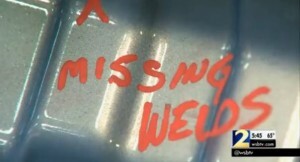 Speaking of welding on Honda Fits, the 2015 model’s roof has a “unique 4-plate spot weld at the roof panel side,” which requires 11 squeeze-type resistant spot welds on each roof panel side flange, the Honda document states. Automotive News in 2014 offered a comprehensive analysis of the Fit’s design, and it’s worth reading their full piece. Instead of using brackets and stiffeners to connect an upper body covered in sheet metal with the lower body, Honda welds the two pieces together without the sheet metal to produce the “inner frame,” according to Automotive News. The manufacturer then welds and bolts the sheet metal to the car, the newspaper reported.